Every year NUNM offers several Global Health trips to different developing nations across the world. Students in the Master of Science in Global Health (MScGH) program must participate in at least one Global Health Experience course, and all NUNM students are welcome to enroll as well. 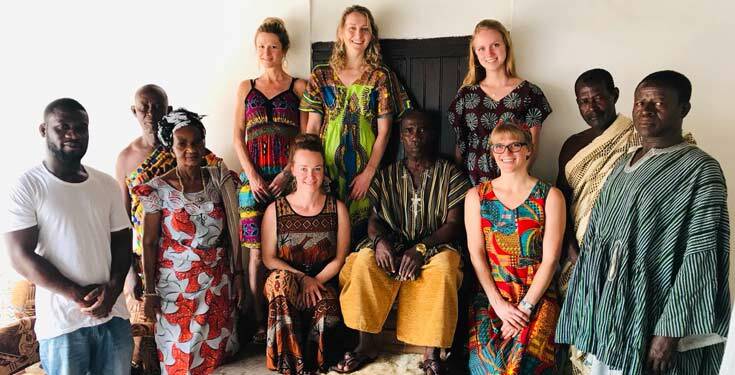 Abena Tuson-Turner, ND, MS and trip leader, recounts their time in Ghana during the 2018/2019 Global Health Trip to Ghana, West Africa. Naturopathic students, masters students and I spent two weeks, over NUNM’s winter break, studying global health in sub-Saharan Africa. The trip was a huge success! The didactic and experiential coursework covered topics in structural competency, cultural humility, globalization, public health, natural childbirth, sexual and reproductive health, comparative health systems, West African herbalism and clinical services in resource-poor settings. We spent the first week of the trip in the capital city, Accra, shadowing Ghanaian medical staff in a large urban hospital setting. Having the opportunity to rotate through multiple areas of the hospital including the labor and delivery ward, the nutrition clinic, the antenatal ward, the triage department, and the operating room (or “theatre” as they call it), students were able to experience the Ghanaian public health care system first hand. In contrast to the city life, we then visited a remote village along Lake Volta to learn about traditional farming practices and food cultivation including aquaculture practices– Ghanaians definitely love their tilapia! The students and I spent the first day meeting the various chiefs and queen mothers who govern the area, receiving blessings for our time there and learning about the history of the region. 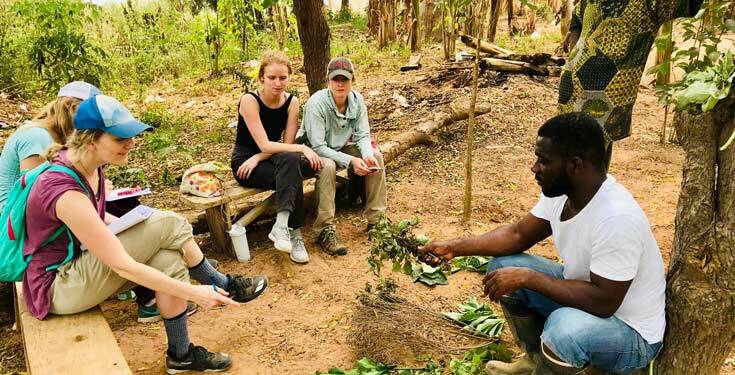 Students spent one day with a local herbalist and healer, hiking around the dusty mountain trails identifying and learning about herbs. We also met the nurse/midwife of the village, in the only clinic within ten miles of the area. She was extremely knowledgeable and spoke frankly with us about the many challenges she and her colleagues face daily trying to reach all the various community members and provide health care in such a rural setting. In our downtime, we wandered through bustling outdoor markets, learned to cook traditional foods, explored the canopy of Kakum National Park, and enjoyed the deliciously flavorful local cuisine. There was also a very special Christmas celebration including lots of delicious local food and a traditional dance performance by the students! Dr. Tuson-Turner has been working behind the scenes with the Ghana Health service for the last 8 years and is currently working on creating a sustainable research partnership with the University of Ghana, School of Public Health. By collaborating in academics and research, this partnership could offer further learning opportunities for ND and graduate level students as well as faculty exchanges and other collaborative learning opportunities. Study Global Health at NUNM.